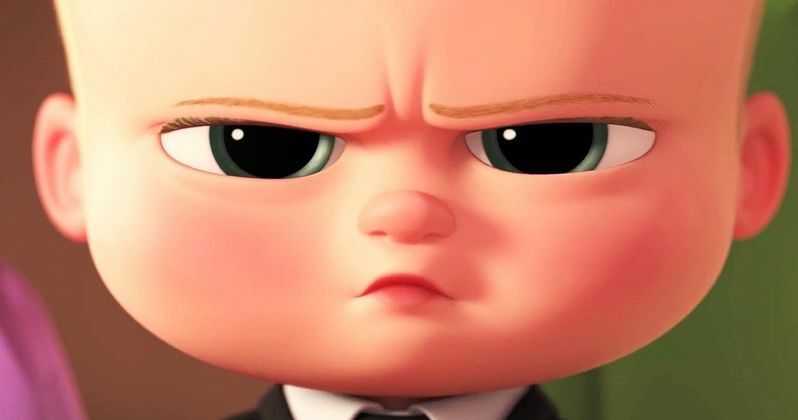 After a successful first weekend at the box office, The Boss Baby, an animated comedy from DreamWorks Animation, had no trouble repeating at the box office. The hit movie went up against Warner Bros.' comedy remake Going in Style, Sony's animated adventure Smurfs: The Lost Village and PureFlix's faith-based drama The Case For Christ. None of these new releases stood a chance, with The Boss Baby repeating atop the box office with $26.3 million, followed closely by Disney's blockbuster Beauty and the Beast with $25 million. Box Office Mojo reports that Smurfs: The Lost Village, Sony's new fully animated movie in the beloved franchise, opened in 3,610 theaters, debuting in third place with $14 million for a meager $3,882 per-screen average. Going in Style debuted in 3,061 theaters in fourth place with $12.5 million with a $4,084 per-screen average, while The Case for Christ opened in 10th place with $3.9 million. Smurfs: The Lost Village and Going In Style weren't critically acclaimed, with Smurfs getting a 39% rating on Rotten Tomatoes and Going in Style getting 44%, although The Case For Christ was a critical hit with 83%. The Boss Baby has now earned $89.3 million domestically. Smurfs: The Lost Village couldn't out-gross the debuts of its predecessors, despite a this new movie marking the return to a fully animated movie that many fans had been hoping for. 2011's The Smurfs, which blended the animated Smurfs with live-action characters played by Neil Patrick Harris, Jayma Mays and Hank Azaria, which fared quite well at the box office, debuting with $35.6 million en route to a $142.6 million domestic take and $563.7 million worldwide take, from just a $110 million budget. The 2013 follow-up The Smurfs 2 managed to stumble quite a bit from its predecessor, at lease at the domestic box office, debuting with just $17.5 million, with a $71 million domestic take, although it still fared well in international territories, with a worldwide gross of $347.5 million from a $105 million budget. In this fully animated, all-new take on the Smurfs, a mysterious map sets Smurfette and her best friends Brainy, Clumsy and Hefty on an exciting and thrilling race through the Forbidden Forest filled with magical creatures to find a mysterious lost village before the evil wizard Gargamel does. Embarking on a rollercoaster journey full of action and danger, the Smurfs are on a course that leads to the discovery of the biggest secret in Smurf history! Sony Pictures Animation's fully-animated features an all new voice cast which includes Demi Lovato as Smurfette, Rainn Wilson as Gargamel, Joe Manganiello as Hefty Smurf, Jack McBrayer as Clumsy Smurf, Danny Pudi as Brainy Smurf and Mandy Patinkin as Papa Smurf. Going in Style is a remake of the 1979 comedy of the same name, which starred George Burns, Lee Strasberg and Art Carney. This new rendition stars Oscar winners Morgan Freeman (Million Dollar Baby), Michael Caine (The Cider House Rules, Hannah and Her Sisters) and Alan Arkin (Little Miss Sunshine) , who play lifelong buddies Willie, Joe and Al. They decide to buck retirement and step off the straight-and-narrow for the first time in their lives when their pension fund becomes a corporate casualty, in director Zach Braff's comedy Going in Style. Desperate to pay the bills and come through for their loved ones, the three risk it all by embarking on a daring bid to knock off the very bank that absconded with their money. Zach Braff (Garden State) directs from a screenplay by Theodore Melfi (St. Vincent). The film also stars two-time Oscar nominee Ann-Margret (Tommy, Carnal Knowledge) as Annie, a grocery cashier who's been checking Al out in more ways than one. Joey King (Wish I Was Here) stars as Joe's whip-smart granddaughter, Brooklyn; with Oscar nominee Matt Dillon (Crash) as FBI Agent Hamer; and Christopher Lloyd (Back to the Future trilogy) as the guys' lodge buddy, Milton. John Ortiz (Silver Linings Playbook) also stars as Jesus, a man of unspecified credentials who agrees to show the guys the ropes, and Peter Serafinowicz (Guardians of the Galaxy) as Joe's former son-in-law, Murphy, whose pot clinic connections may finally prove useful. The top 10 is rounded out by Ghost in the Shell ($7.3 million), Power Rangers ($6.2 million), Kong: Skull Island ($5.8 million), Logan ($4.05 million), Get Out ($4.02 million) and The Case for Christ ($3.9 million). Also opening in limited release is Neon's Colossal, which earned $125,809 from four theaters for an impressive $31,452 per-screen average. Fox Searchlight's Gifted earned $476,000 from 56 theaters for a decent $8,500 per-screen average, while IFC's Graduation earned $11,040 from two theaters for a $5,520 per-screen average. STX Entertainment's Their Finest earned $77,000 from four theaters for a $19,250 per-screen average, but not box office data was released for Magnolia's Alive and Kicking and Cezanne et moi, Parade Deck's The Eyes, Well Go USA's Mine, Shout! Factory's The Ticket, FilmRise's Truman Screen Media's The Void and Funimation's Your Name. It isn't clear at this time if any of these films are planning to expand nationwide in the weeks ahead. Looking ahead to next weekend, Universal's highly-anticipated sequel The Fate of the Furious will open nationwide, going up against the Open Road Films animated comedy Spark. The Fate of the Furious will likely debut to huge numbers next weekend, but it isn't known how many theaters it will be arriving in at this time, but the animated comedy Spark shouldn't provide too much competition for this action sequel. Also opening in limited release is the Indican horror film 7 Witches, Abramorama's documentary Chasing Trane: The John Coltrane Documentary, The Orchard's documentary Jeremiah Tower, Bleecker Street's action-adventure The Lost City of Z, Sony Pictures Classic's dramatic thriller Norman: The Moderate Rise and Tragic Fall of a New York Fixer, Music Box Films' drama A Quiet Passion, Under the Milky Way's drama The Student and Roadside Attractions' drama Tommy's Honour. Take a look at the top 10 for the weekend of April 7, and check back Sunday for the box office estimates.